STM's bread and butter are their bags and cases, but what we have here is something entirely different. 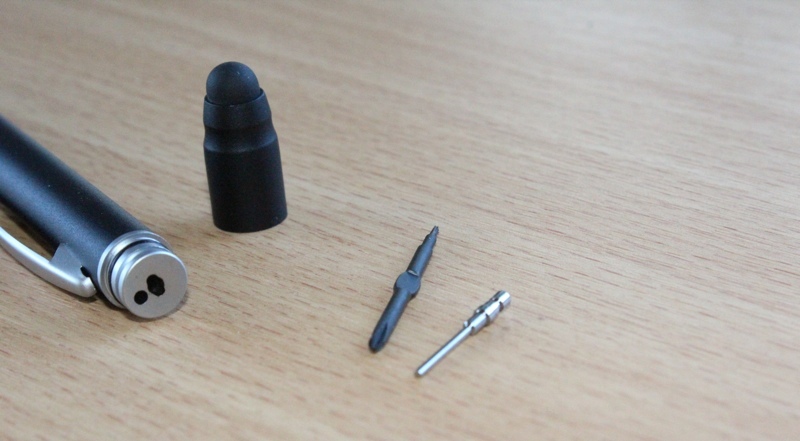 It's a stylus from the company called the STM Tracer Deluxe, it differentiates itself within the packed stylus market by incorporating an inbuilt pen, screwdrivers and a SIM ejector tool. 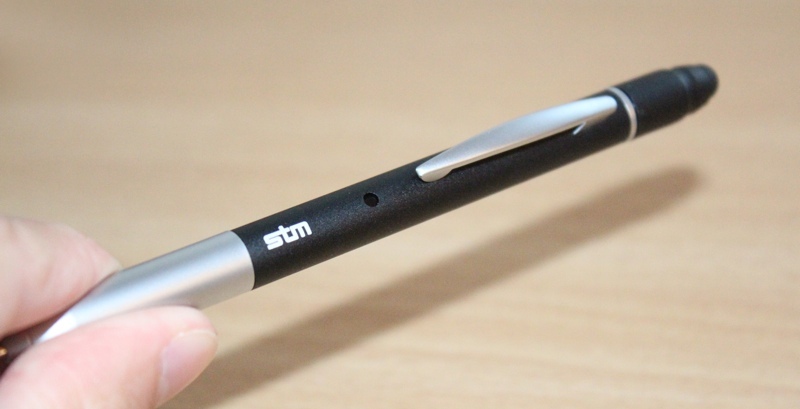 The design of the STM Tracer Deluxe is more pen-like than stylus-like. When using it as a pen it isn't obvious that a stylus is on top, instead it appears as if you're holding one of those pens with an eraser equipped. It's available in two colour schemes, we have the sleek looking black on silver and a solid silver coloured model is available too. The Tracer Deluxe is lightweight but feels substantial in the hand, regardless of whether you're using it as a stylus or pen. The pen nib appears to be built out of some kind of metal; our guess is stainless steel, which would also be used on the pocket clip of our model. The rest of the stylus feels as if it's constructed from the same materials but has a nice rough texture for increased grip. The pen is multifunctional, it has both red and black pen cartridges inbuilt which are accessible via a twist of the pen nib. If one of the cartridges runs out they are replaceable with standard ink cartridges. Writing with the Tracer Deluxe as a pen was pleasurable; its comfortable and tidy design induces a pleasant writing experience when used for hours on end. The rubber stylus located at the other end of the Tracer Deluxe is a standard sort of stylus tip. It will interact with all capacitive touch screens. 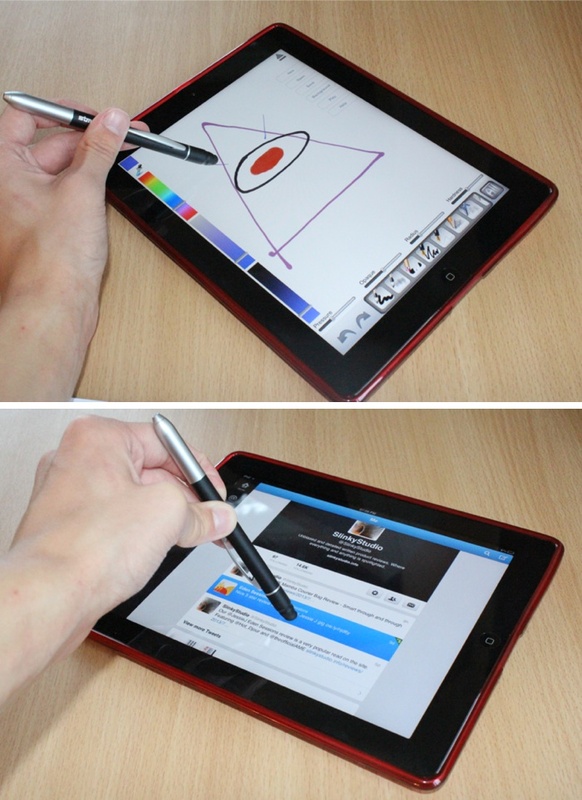 The tip only has one size, which is the popular size within the stylus spectrum, and we found it to be suitable and very responsive for drawing and jotting down notes on capacitive touch screens. Interacting and controlling devices general operating systems is non troublesome but multitouch gestures that are required aspects of iOS aren't truly possible to do with the stylus. And typing is a slow-winded process. One major criticism we had when using the STM Tracer Deluxe as a stylus is its removable tip, which exposes its included tools. This tip is easily removed from the Tracer Deluxe and has come loose without our notice. It's absolutely terrifying to look down at the tip of the stylus and notice that you're actually interacting with your screen via a metal screwdriver and a SIM card ejector tool! This has happened a few of times and thankfully we haven't had any scratched screens from it, but it could definitely lead to scratches. The removable screwdriver is double ended with two different heads. One's a phillips screwdriver head and the other is a 5-point pentalobe which is designed to unscrew small screws; probably because smaller screws are frequently found on electronic devices. The SIM card ejector tool works and could prove useful if stranded and in the need of a quick SIM card change. Overall the harmonious design of both a pen and stylus, that also includes a sim ejector tool and screwdriver works rather well. Priced at £24.99 within the UK and $29.99 within the USA, is accurate for such a tremendous build and features.